Simple arranger with digital PCM drums and some analog sections like bass especially designed for real-time arranger performance. 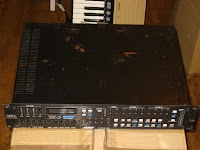 The ts4k is the keyboard version and TS4 is a 2 units rackmount version, project derived from previous model Programmer 24. KEYBOARD 49 velocity keys. 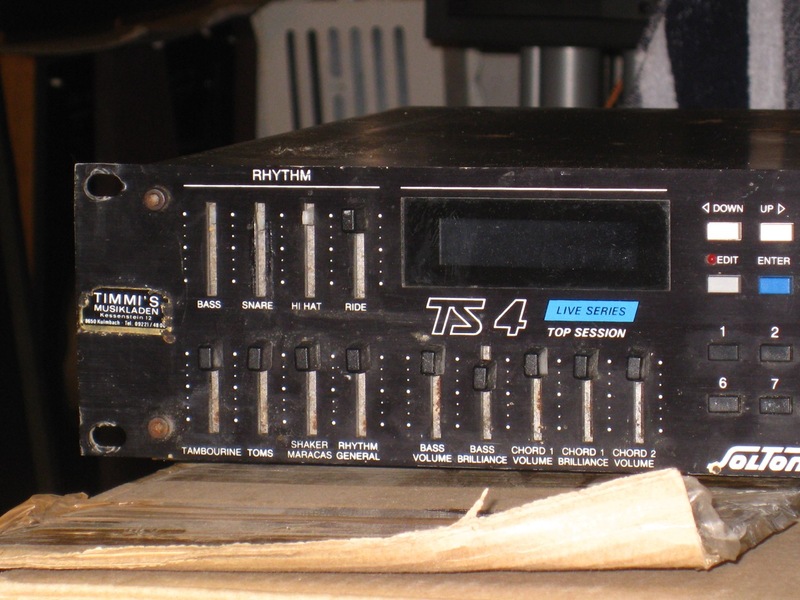 Main panel features a 16 x 2 LCD display, 48 buttons and 13 sliders for mixing parts control. Quite oddly the pitchbender is located on top left. Power supply is a custom model PSU with AC-AC weird pinout! 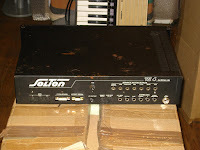 SOLTON TS3 : another accompaniment rack mount unit, should be really close to TS4 series. Not much info about it. 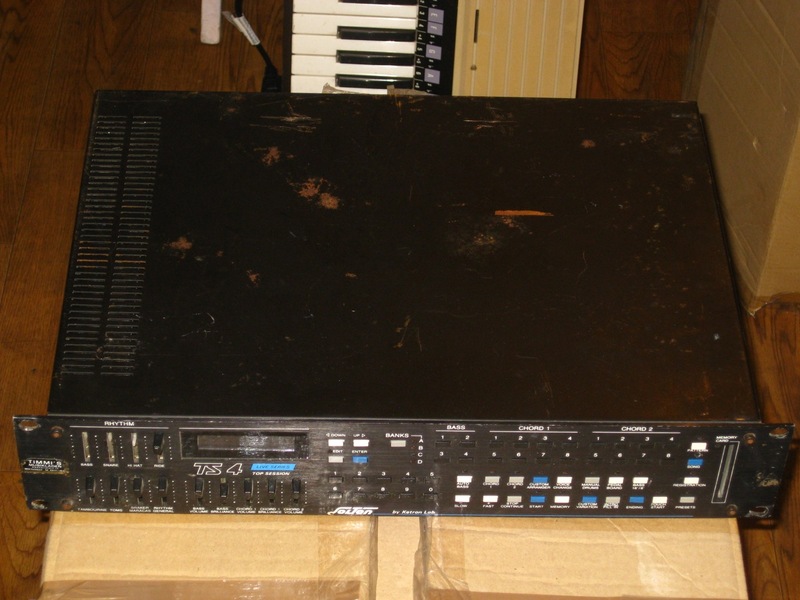 VOICE machine based on a 8031 INTEL 8-bits CPU. 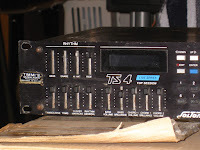 TECH the polyphonic section is technically interesting based on a SGS Thompson M114S IC digital "sound tone generator" which read data off an eprom. This chip is used for the so-called "crosswaves" also implemented on other more famous machines e.g Amstrad Fidelity CKX1000, Keytek CTS-2000/1000. - DRUMS 7 channels with individual gain and outs for a total of 43 percussions sounds samples.Some drum functions like ROLL and FLAME. Drums includes: kick, snare, Hihat, ride, tambourine, toms, shaker-maracas. ARRANGER classic fingered playing with styles and auto-accompaniment but also recording with quantizes from 4 to 96 resolution and variable time signature. 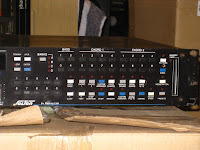 TIP machine can be slaved to external MIDI clock. MIDI each section is assignable to a different channel. 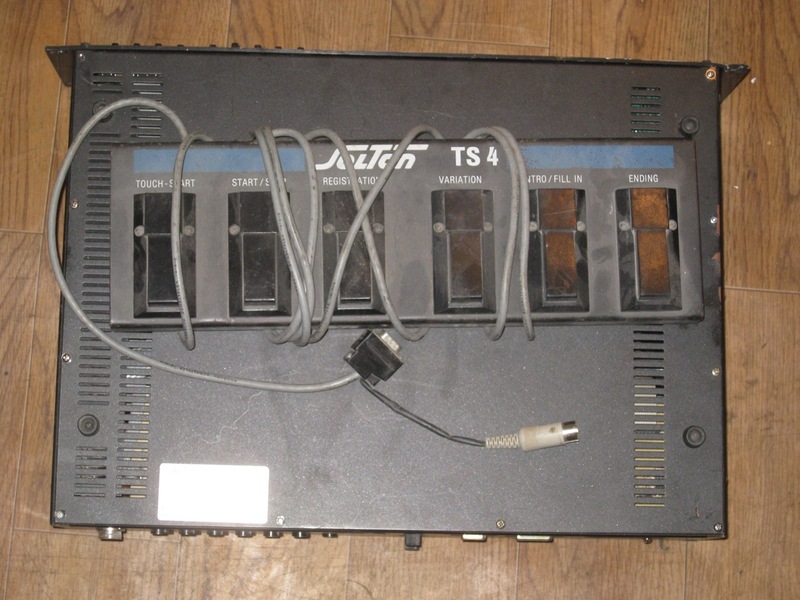 - 32 slot RAM, 64 extra slots can be added using custom RAM cartridge. 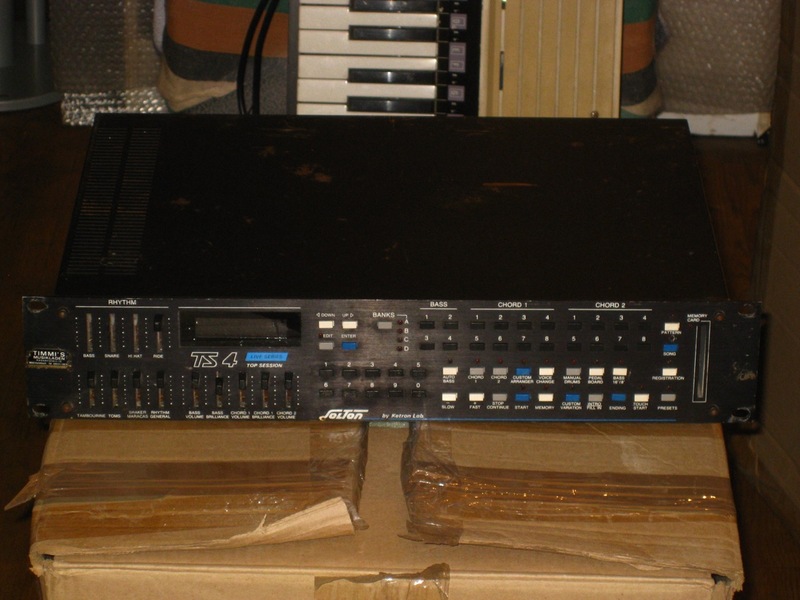 - dual VCA CEM 3360 amplifier (used in some PPG, Crumar Spirit, Ensoniq ESQ-1, Linn drum and even holy grail Synton Syrinx). 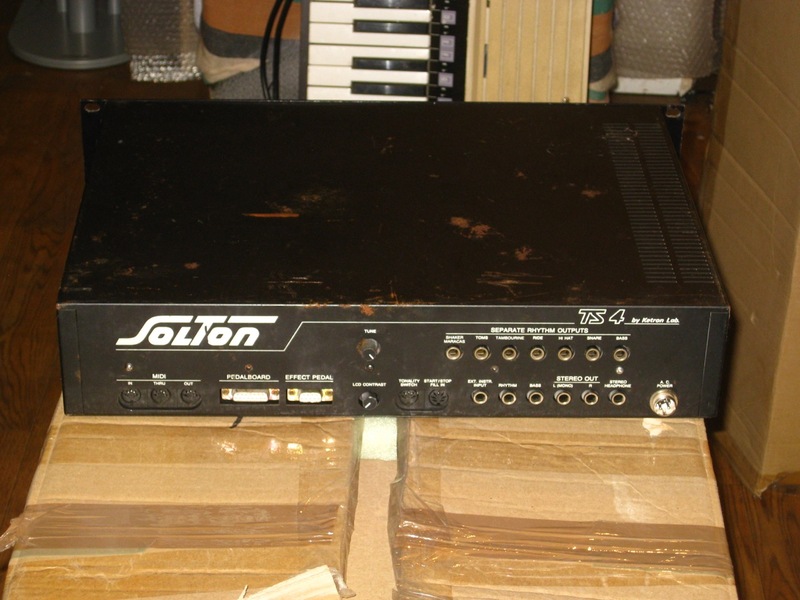 -SSM-2300 as multiplexer sample and hold same found on the Ensoniq SQ-80. This unit accompanies the accordion very well. It is particularly notable for the incredible array of left hand possibilities as well as right hand settings. There is advanced programming of the rhythms. We particularly like settings which use the automatic capabilities but on when triggered by keys/ buttons pressed and find that it adds hugely to the sound produced by the player. 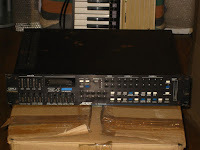 This unit is rack mount but completely encased so can be used free standing. There are numerous red LEDs to indicate functions selected and an LCD screen to indicate status of the various settings. 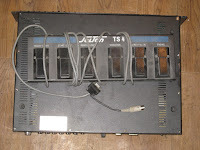 The unit is in good condition although it has be used in a rack with some signs minor of use to the casing. On the rhythm side there are separate slider volume controls for bass, snare, hihat, ride, tambourine, toms, shaker maracas, general rhythm. There are also separate slider volume controls for bass, bass brilliance, chord, chord brilliance, chord2 volume. 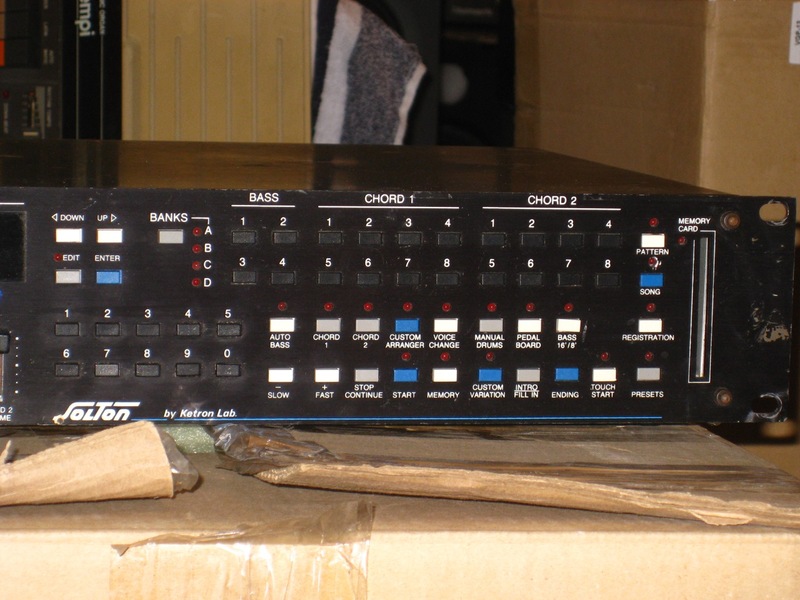 There are numerous banks and buttons for bass, chord1 and chord2. For the accordion one of these settings can be used for the right hand. There is auto bass, custom arranger, chord1, chord2, voice change, manual drums, bass 16/8 feet, tempo, stop/continue, start, memory, custom variation, intro fill in, ending, touch start, presets, pattern, song, registration, edit and enter and up and down buttons. 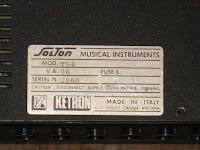 Functions selected are shown on an LCD screen with LCD contrast rotary knob. 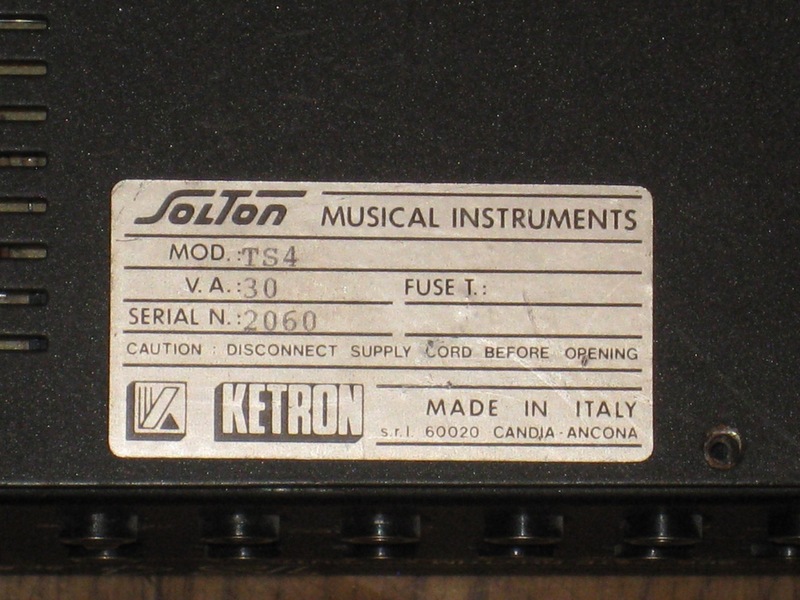 There are midi in, out and through connectors. Outputs in clued mono (L) or stereo (L and R) . Unusually it is possible to output instruments on their own jacks if required. These include shaker maracas, toms, tambourine, ride, hi hat, snare, bass, rhythm, bass. There are also stereo headphone sockets and external instrument inputs. 91 types of percussion instruments, 64 registrations, ability to program your own rhythms, custom arranger, fingered (plays only what you press on your instrument), manual. Set separate channels for keyboard, bass, chord1, chord2, rhythm, program change.